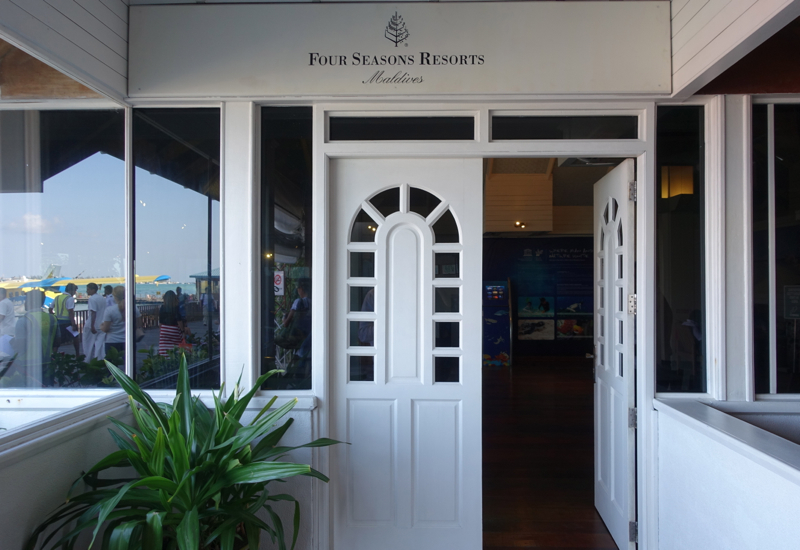 After a long journey to get to the Maldives, it's a welcome sight to see a Four Seasons Representative waiting for you at Male Airport, smiling and ushering you to the nearby Four Seasons arrivals lounge. 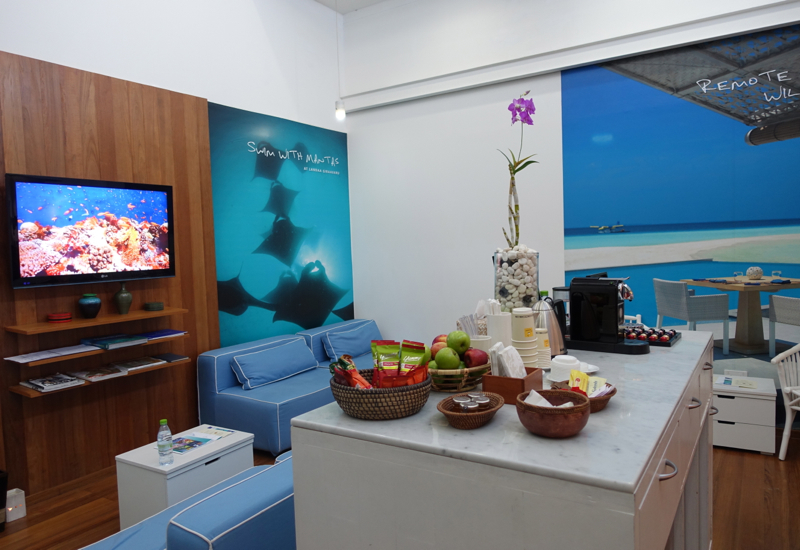 This is in fact just a “mini lounge” that you'll likely spend just 10-15 minutes at, before being whisked away to the larger Four Seasons Maldives lounge at the seaplane terminal. 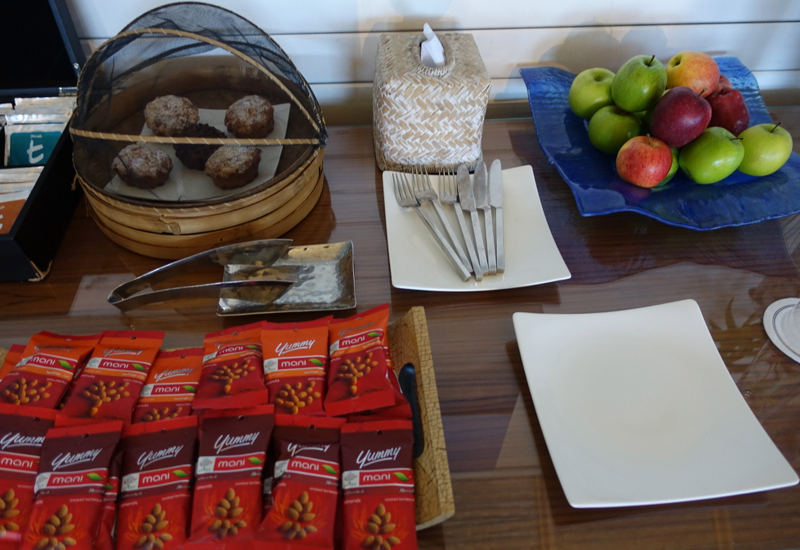 Nevertheless, it offers comfortable seating, fresh fruit, cold drinks, and a Nespresso machine, as well as video footage of the resorts you're about to experience. 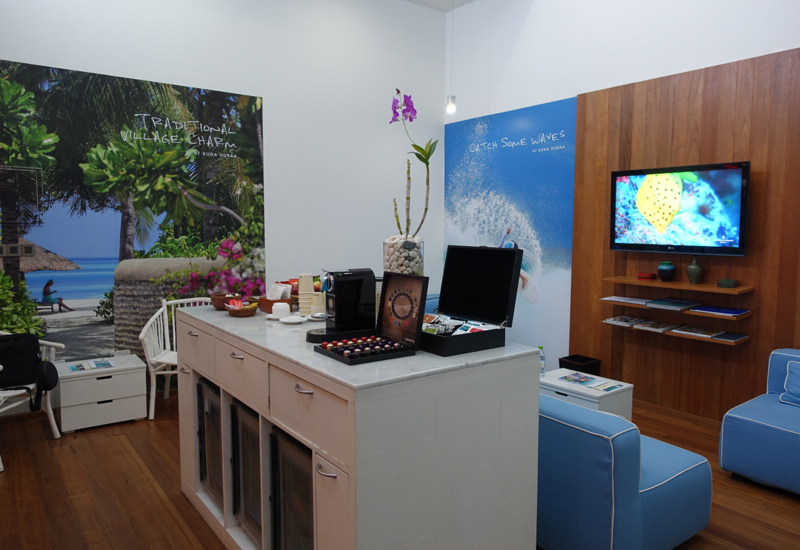 A short air-conditioned van ride takes you to the seaplane terminal, which has plenty of open air general seating; however, the Four Seasons lounge offers a more comfortable experience, just inside the white entrance doors. 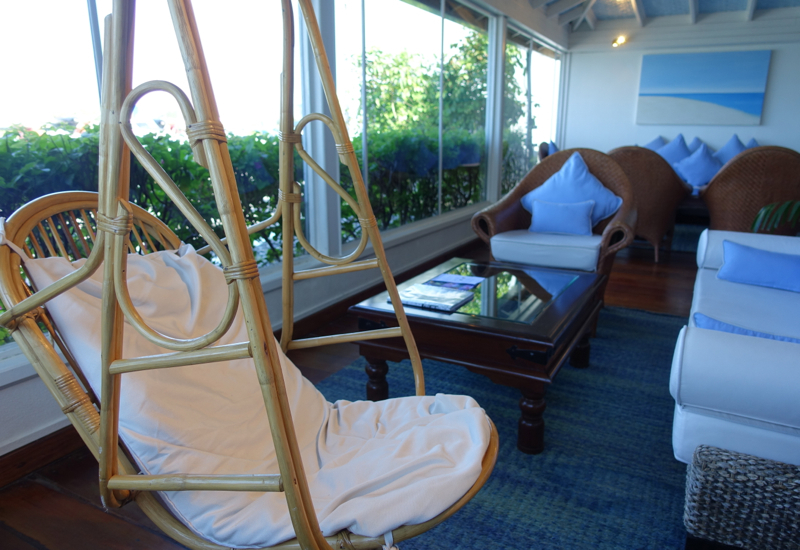 The munchkin enjoyed the swing seats, and these and many other seats provide a good vantage point to watch the seaplanes. 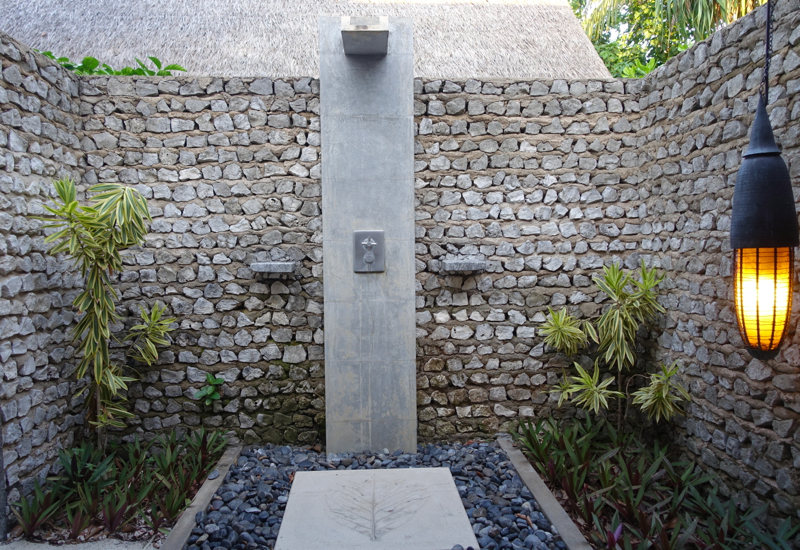 There's also a shower room, although we scarcely would have had time for a shower, given that we only waited about 20 minutes or so until our Trans Maldivian seaplane was ready for boarding. 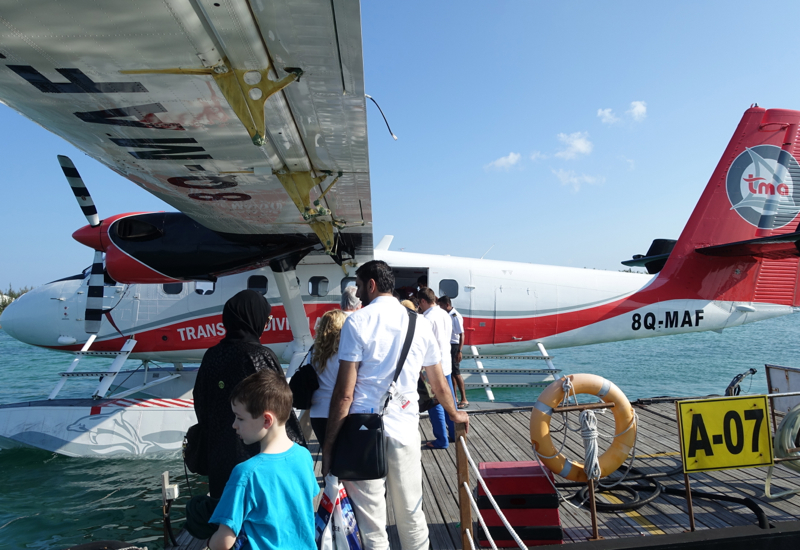 We had a number of seaplane rides this trip to the Maldives, and my son wasn't too keen on them, although thankfully they're not that long: in each case, about half an hour. They do get pretty hot, especially while prior to take-off, and you'll want to protect your ears with earplugs. I recommend bringing a pair that fit, since the foam ones that are provided always seem to not fit well and to come out. 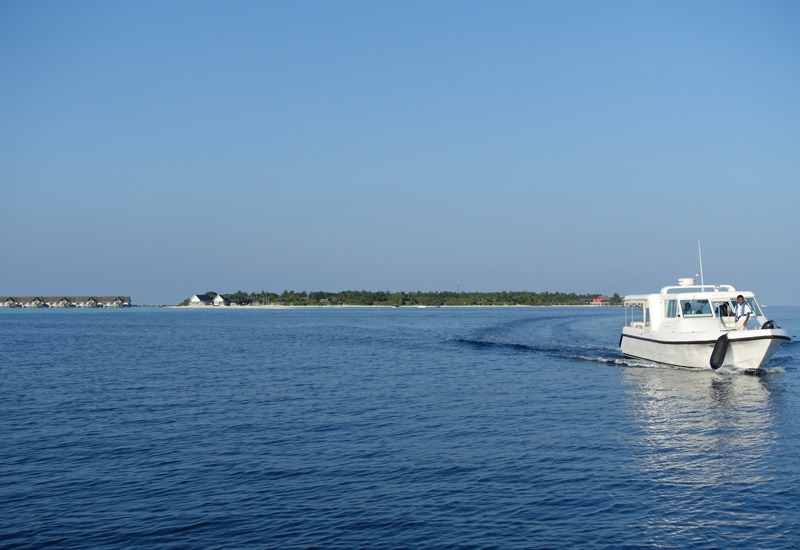 It was a welcome sight when the Four Seasons Maldives at Landaa Giraavaru came into view. The plane actuallly lands at a buoy a little distance from the resort (a nice touch, since once at the resort you never notice any noise from seaplane flights) and a Four Seasons speedboat takes you the short distance to the pier. 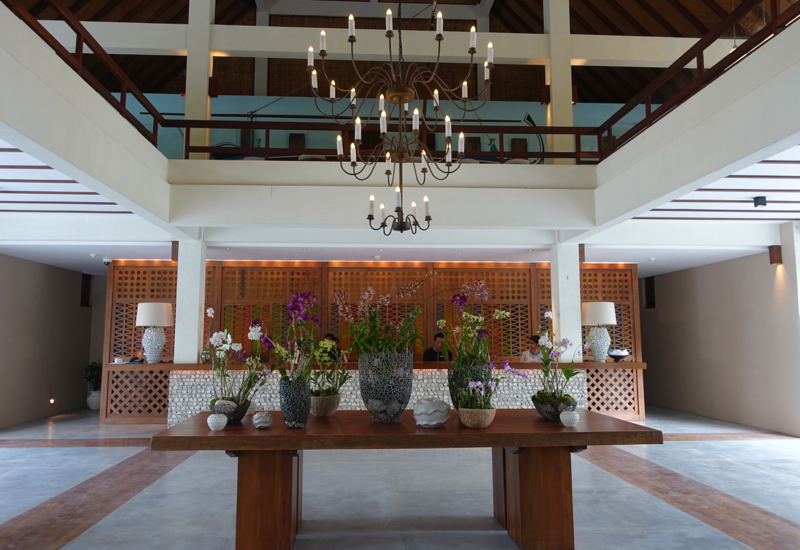 The hot and noisy seaplane flight was soon forgotten in the airy and spacious Landaa Giraavaru lobby. 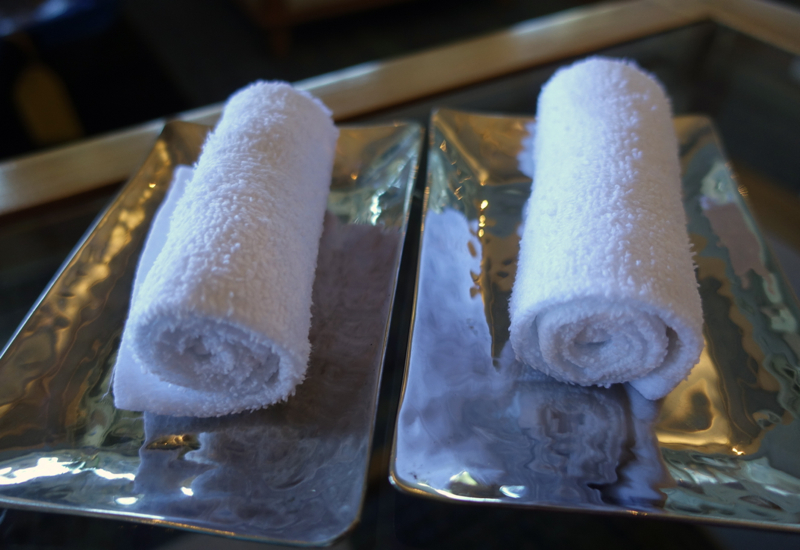 Since we had already completed our check-in formalities in the lounge, we had only to enjoy cool towels and delicious young coconut milk welcome drinks. 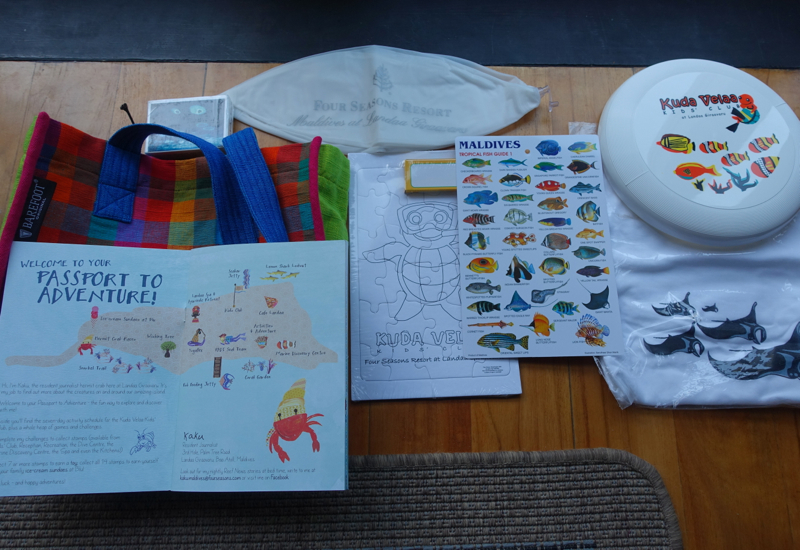 My son also received, from Four Seasons Landaa Giraavaru General Manager Armando Kraenzlin himself, a colorful tote filled with an activities “passport,” manta ray t-shirt, beach ball, frisbee, coloring pencils and puzzle, playing cards, and a handy card to identify all the tropical fish, which had the munchkin beaming. And he also enjoyed coloring at the table in our covered terrace. 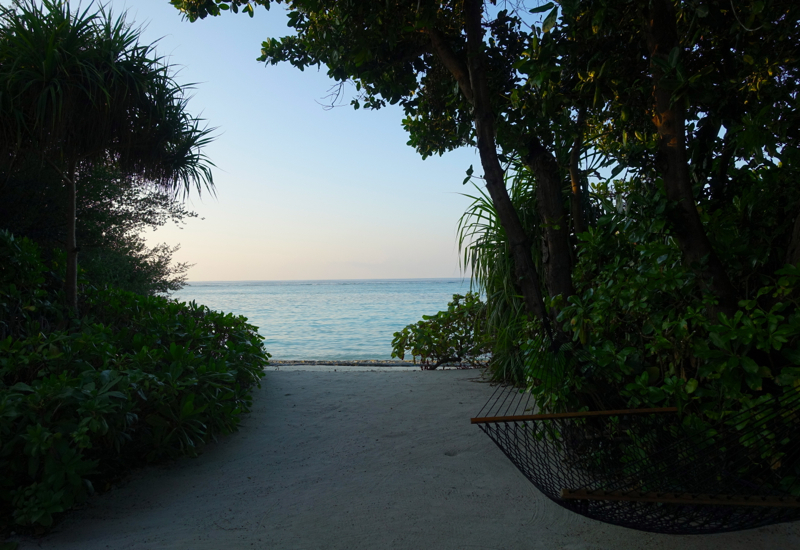 Nearby were two sun loungers, though we ended up being too busy to ever use them. 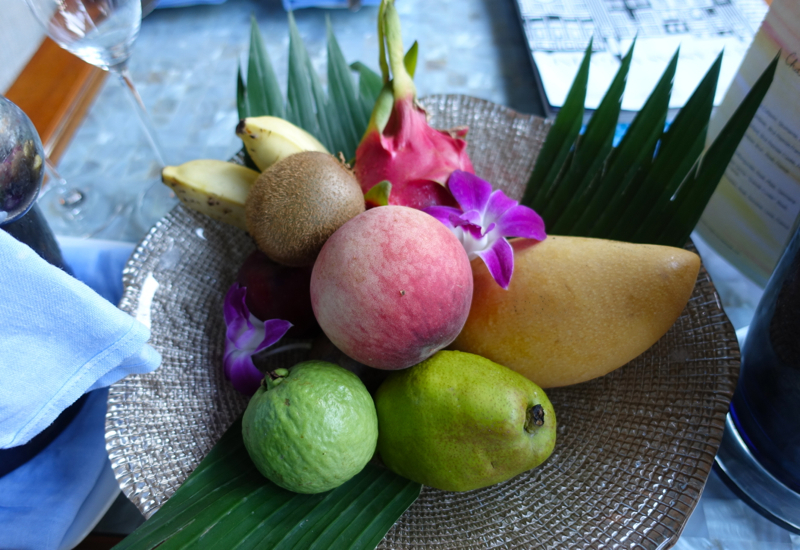 Inside, our welcome amenities included a beautiful fruit bowl which both of us enjoyed, plus fruit skewers and a smoothie for my son. 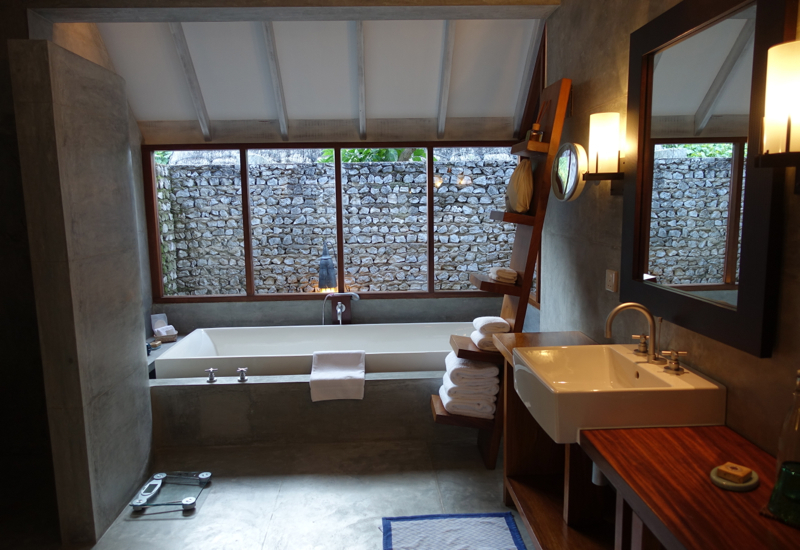 The Four Seasons signature bed was so comfortable–without a doubt, I got my best sleep here and at Four Seasons Maldives at Kuda Huraa. My son had his own little bed, which he also slept so well in that I had to wake him up both mornings, which never happens at home. 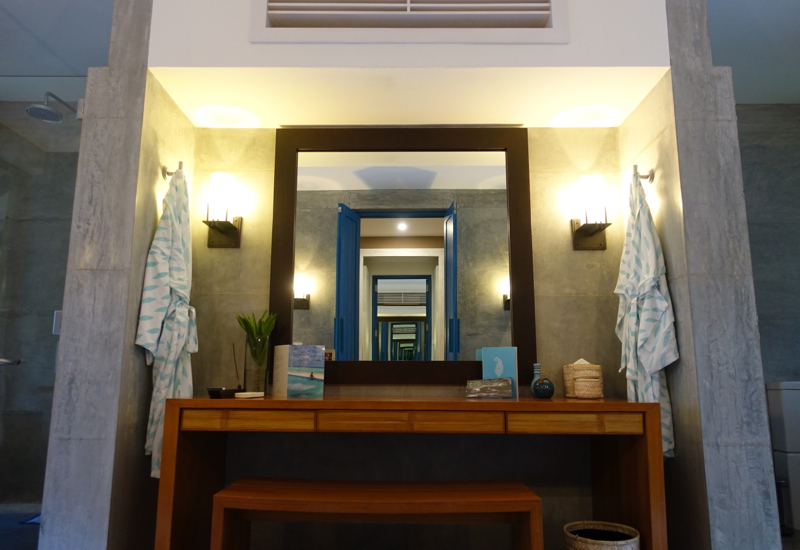 The bathroom offered his and hers sinks, as well as a large mirrored vanity with a seat, perfect when I had to do work at night after putting my son to bed. 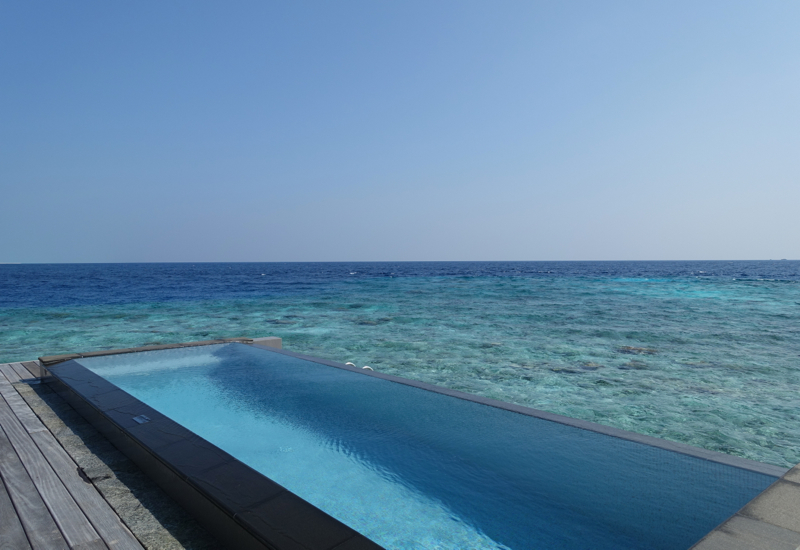 During our stay, I also had a chance to go out to the water villa jetty and view a Sunset Two Bedroom Water Suite with an infinity edge pool, and gorgeous water views. Killer views with Four Seasons service and amenities? Yes please! 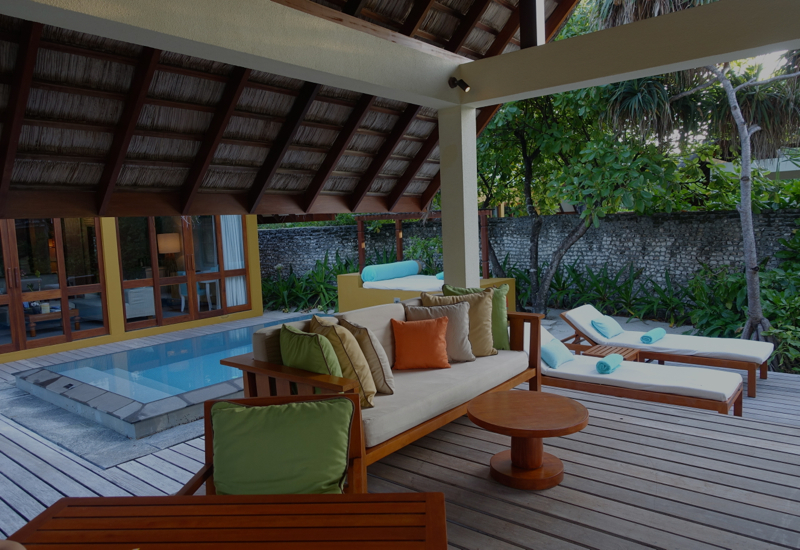 Interestingly, the Beach Villa with Pool is often even more popular than the Water Villas and Suites, at Landaa Giraavaru. 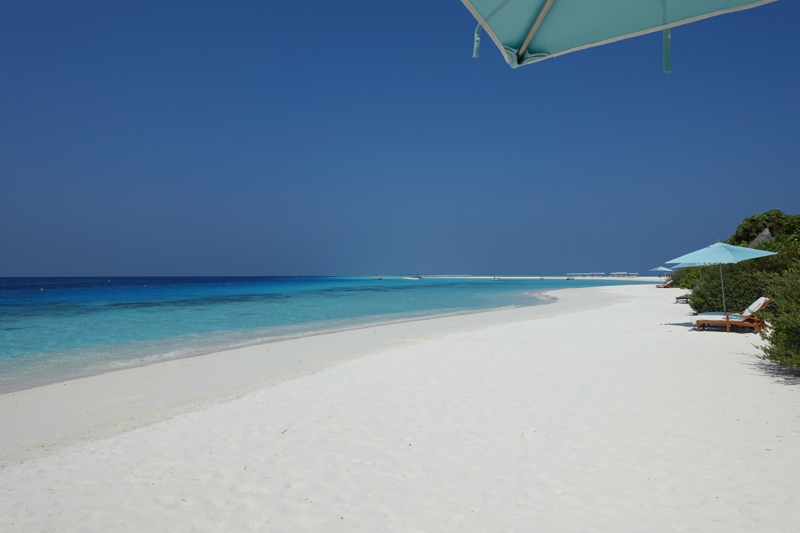 Not only do you have a long pool and plenty of living space, indoors and outside, you're just steps away from the best beach I've experienced in the Maldives (although not quite as powdery fine as Amanpulo). 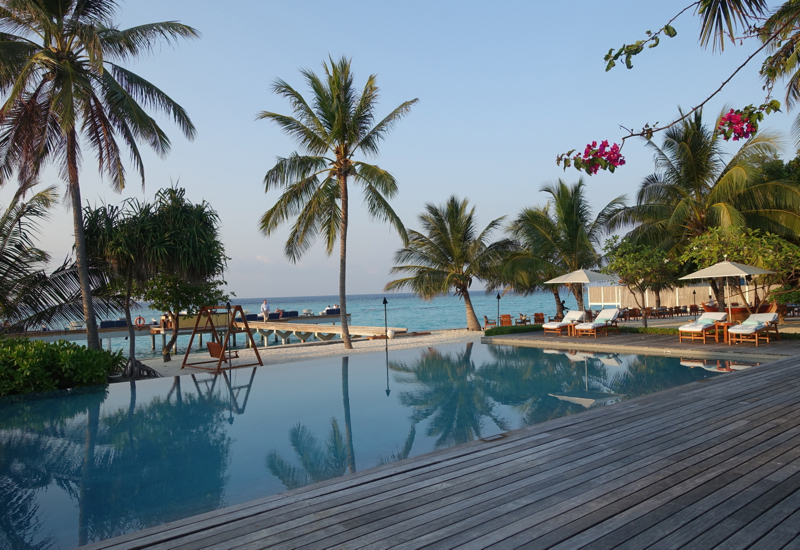 You might wonder if you'd need any other pool if you already have your own pool with your Beach Bungalow or Water Villa, not to mention the incredible turquoise Indian Ocean surrounding the island. 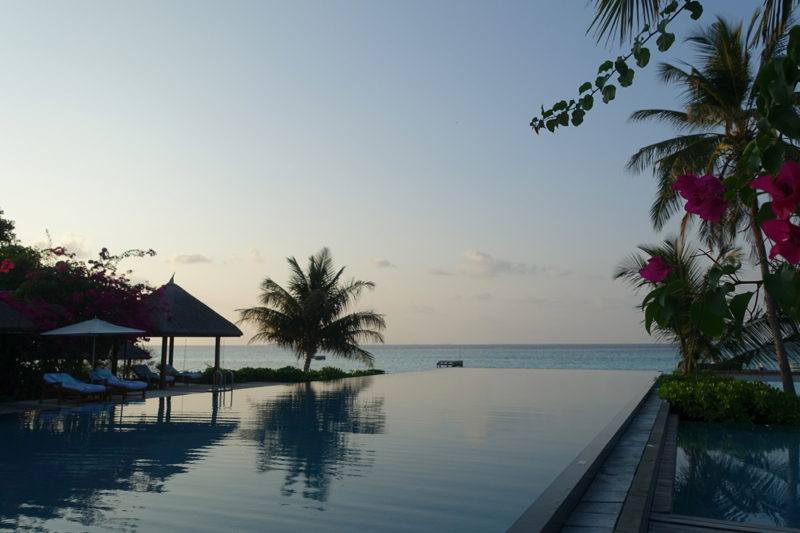 But it's actually nice for kids to be able to play with each other in the main infinity edge pool (the only Olympic sized pool in the Maldives), plus the adjacent seawater pool, which is also used for aqua yoga. 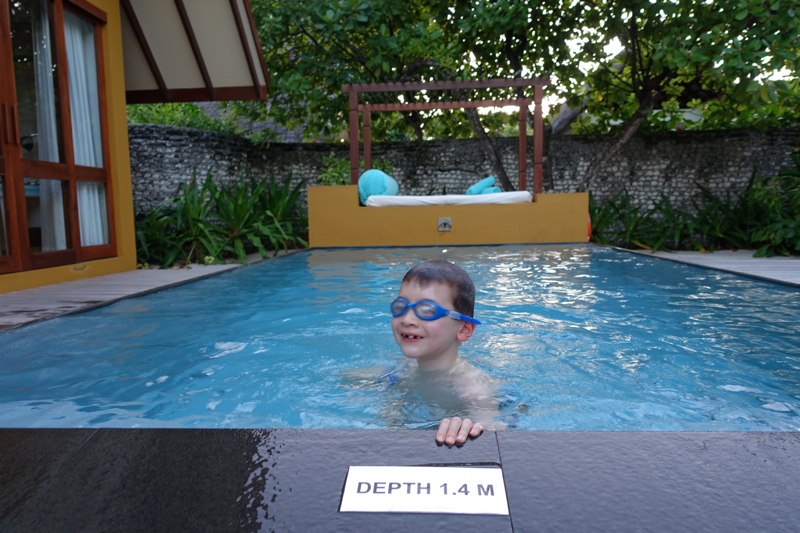 For the youngest children, there's a shallow wading pool with waterfall that is part of the Kids for All Seasons Kuda Velaa (“little turtle”) kids' club, and there's also a pool at our favorite restaurant at the resort, Blu. 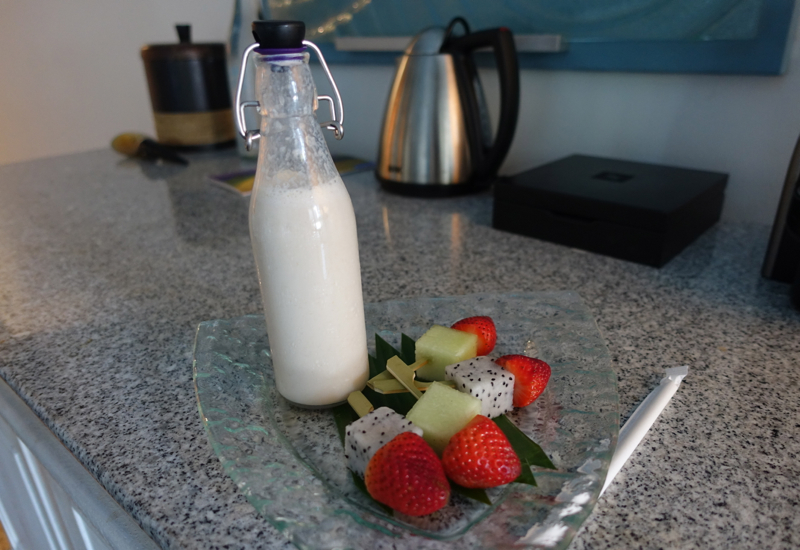 The resort offers several restaurants: Blu, Al Barakat, Cafe Landaa and Fuego Grill, and I'll cover our breakfast and dining experiences and menus in a separate post. 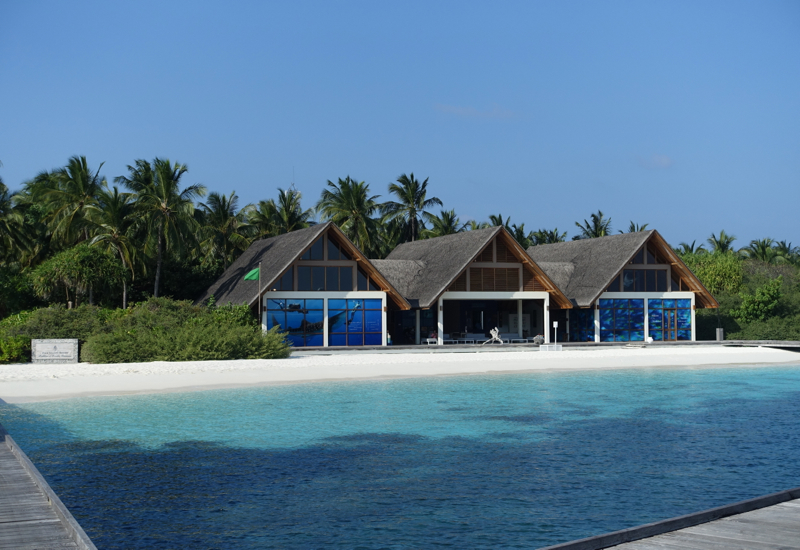 Snorkeling and diving are top draws at Landaa Giraavaru, with its more remote location near the Baa Atoll and Hanifaru Bay, where it's possible to see scores of manta rays at a time and sometimes whale sharks as well. Snorkeling is best near the arrival pier, and during our snorkeling and even while just strolling along the sand, in addition to an abundance of fish, we saw several baby lemon sharks. I'll cover additional activities in a future post. 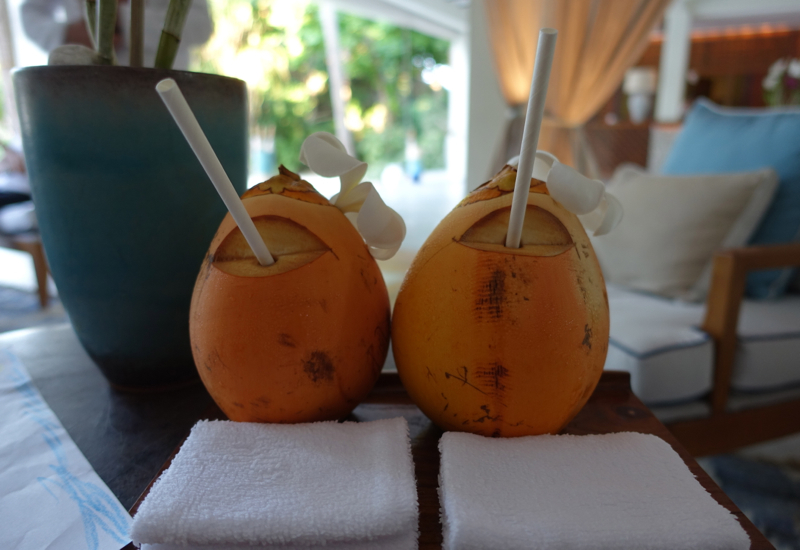 I've now visited 5 different luxury resorts in the Maldives, each with its own unique features, pluses and challenges. 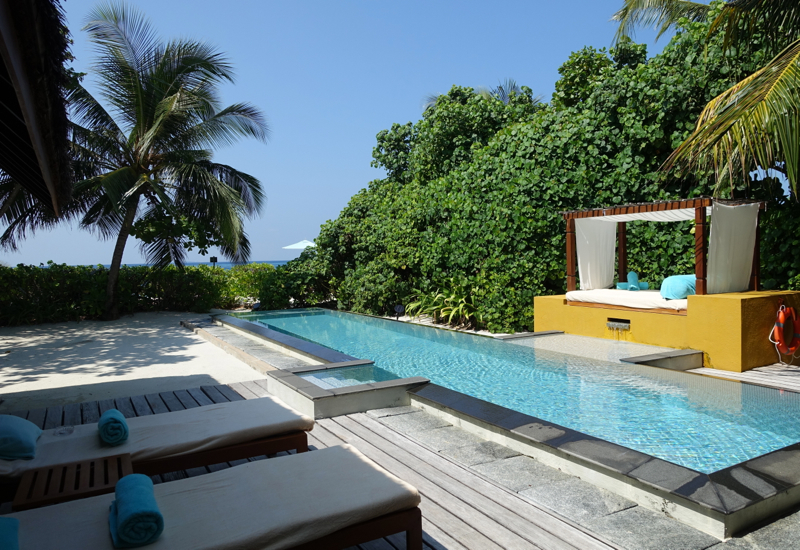 While there are definitely particular strengths of other resorts that I love, overall I consider Four Seasons Maldives at Landaa Giraavaru the best of the 5 resorts I've visited, taking into account the bungalows and villas, the beach, level of service, nearby dive sites, dining and amenities. 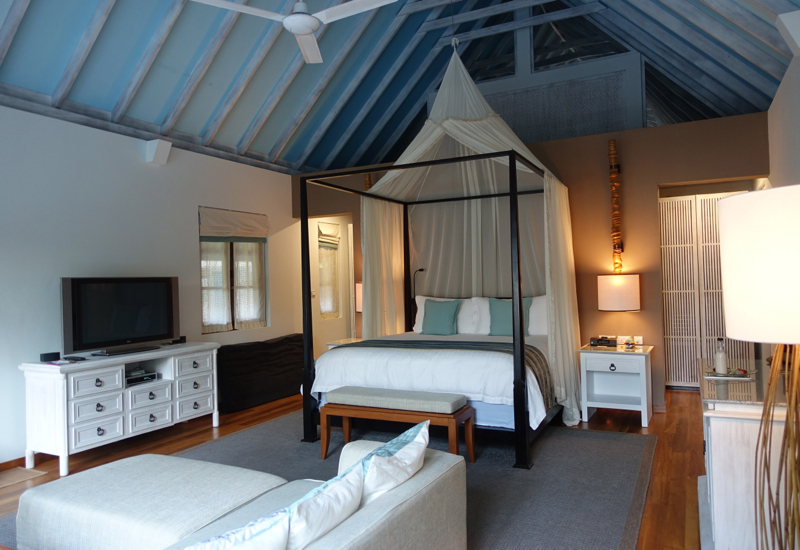 And as at other top Four Seasons resorts, such as Four Seasons Hualalai, Landaa Giraavaru does an incredible job of providing special couples' experiences for those celebrating a honeymoon or special anniversary trip, while also engaging kids with all kinds of exciting marine discovery, cooking classes and even Dhivehi language lessons. 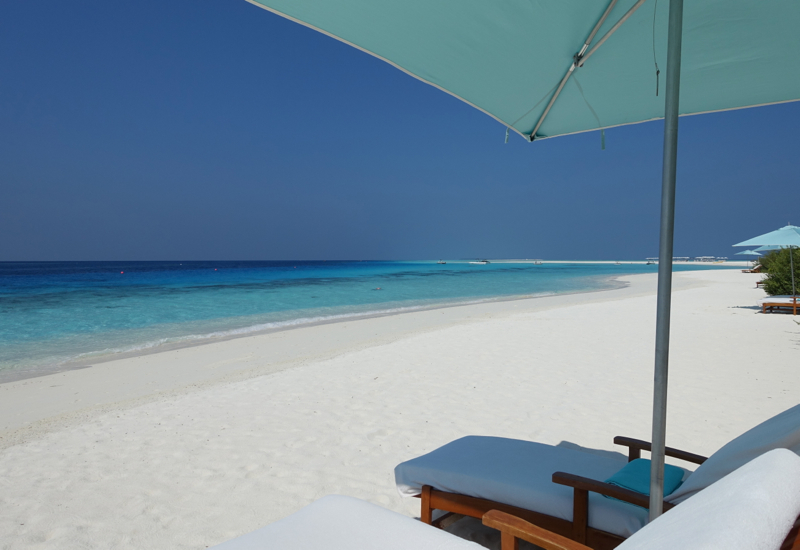 Become a TravelSort Client and Book Four Seasons Landaa Giraavaru with Preferred Partner Perks!